Born in Berlin, Germany, after his family moved there from Poland, Mr. Schreiber immigrated to the United States in 1939 to escape war-torn Europe, and later served as a US Army soldier in WWII. He was a student of the late Reuben Tam at the Brooklyn Museum Art School. Mr. Schreiber enjoyed a long and successful art career both as a commercial art director in New York City with Dell Publishing and others, and as a passionate creative geometric artist exhibiting in many NYC galleries. Perhaps stemming from his early apprenticeship in the diamond trade, his work is a commitment to the hard-edge experience. In addition to New York City, Mr. Schreiber exhibited in Miami, Palm Beach and Boca Raton Florida; Dallas, Texas; Montreal, Canada; and Sao Paulo, Brazil. 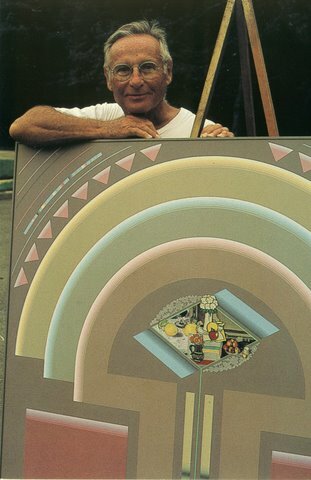 Known for his highly disciplined art form, Mr. Schreiber’s work was described by Newsday’s Malcolm Preston as ‘almost surgical precision of craftsmanship.’ Through subtle changes of color and intensity, his hard-edge band style produces soft edge light vibration and illusions of spatial expansion. In his sculpture and wall constructions, the artist directs small progressions in shape and size towards the same spatial expansion witnessed in his paintings. His work can be seen at the West Palm Beach Airport, where the Schreiber Family donated a painting for the Art in Public Places program. Martin Schreiber’s work is part of the permanent collection at the Boca Raton Museum of Art. Two of Mr. Schreiber’s geometric canvasses are exhibited at the Dallas Museum of Geometric and MADI Art, in Dallas, Texas. The museum curated the Martin Schreiber Retrospective in Dallas, which was on public view from October 2011 through January 2012. Martin Schreiber's work has recently been exhibited in 2012 to 2013 at Art Fusion Galleries in Maimi, in 2014 and 2015 at Art Design Consultants in Cincinnatti, in 2014 at Spectrum Miami, and in 2015 at Art San Diego. “A series of beautifully crafted works, geometrically abstract, sensuous and radiant in their color relationships and illusionistic in their handling of form and space…It is the color usage, in combination with the spatial intervals and the almost surgical precision of the craftsmanship that gives these paintings their appeal. The flatness of the surface, devoid of brush stroke, and the flawless execution produce a lyrical yet resonant visual experience.